The Lamy Studio seemed to be overlooked by many in my local fountain pen community. I have never seen one in the wild before. It is a cartridge converter fountain pen with a metal body and a snap on cap. It takes the Lamy Z26 converter. The pen comes in a number of finishes. I got mine from Pen Chalet in the brushed stainless steel finish. 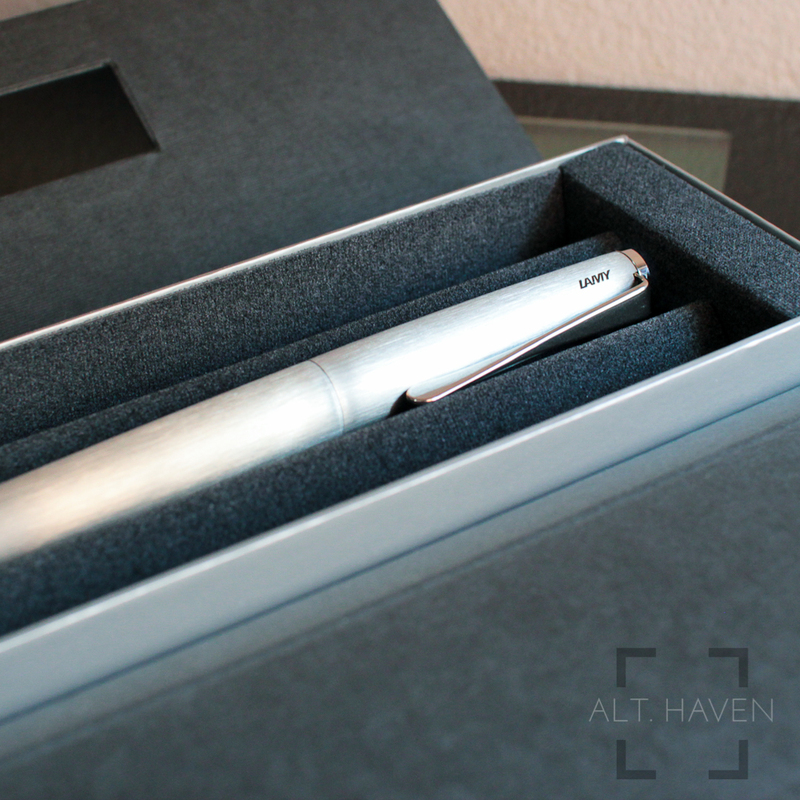 The Lamy Studio comes in a regular cardboard box. 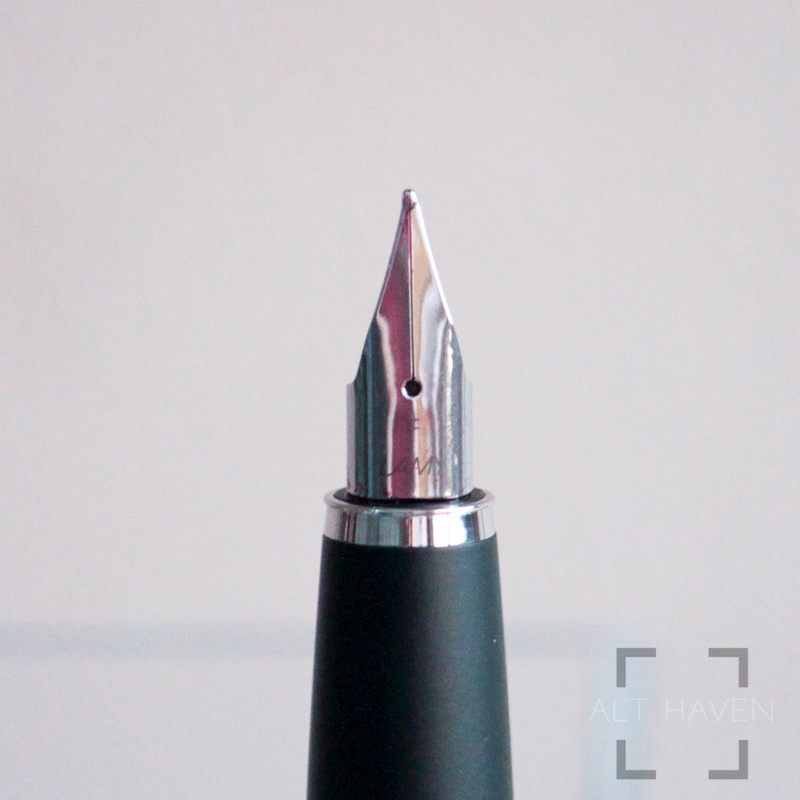 It is a step up from the small box that the Lamy Safari) and Al-Star comes in. The box unfolds outwards and inside you will find a cartridge, a marketing booklet, a warrenty policy booklet and the pen itself. The design of the box is nice but it is still a cardboard box at the end of the day. The Lamy Studio feels really good to the touch. The brushed stainless steel finish is smooth but yet has a distinct texture to it. This particular finish will not retain fingerprints all over it. I love the design of the clip in particular. It starts out board where it connects to the cap and tapers down to a narrow point at the end. The modern design gives the pen a timeless look to it. I also like that the branding is kept small and to one end of the pen. The metal body gives the pen heft and weight. However, it isn't so heavy that it fatigues your hand if you use it for long periods. It is also well balanced when unposted. Push the cap down onto the end of the barrel to get a satisfying click when posting the cap. The cap doesn't fit flush against the barrel so when I shake the pen slightly, the cap rattles lightly against the barrel. Personally, I found it slightly back heavy once I have posted the cap. I got my pen in a fine nib. The nib is smooth and it works great right out of the box. It glides across the page easily. 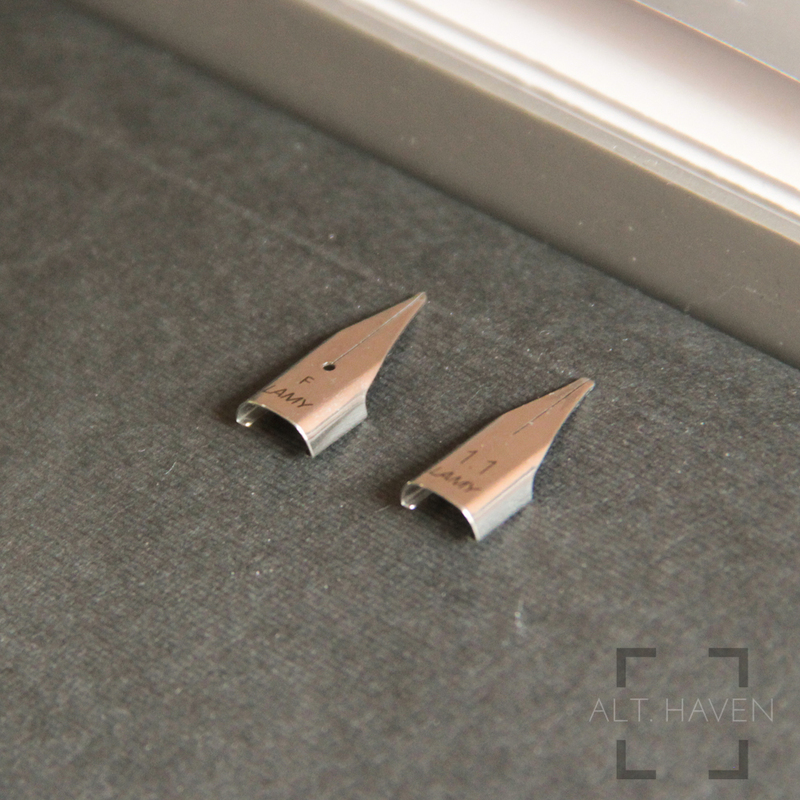 The Lamy Studio shares the same nib as the Safari as well as the Al-Star so the nibs are interchangable. The nibs can be purchased seperately. The nibs available are EF, F, M, B, 1.1, 1.5 and 1.9. They come in black as well as silver. Those who have problems with the Lamy Safari and the Al-Star because of the triangular grip section. They would have no problems with the Lamy Studio. The black round grip section of the Lamy Studio works better for me. It has a slightly rubbery grip to it. Since the Lamy Studio has a snap on cap there are no threads to worry about. There isn't a giant step between the pen barrel and the grip section. It just tapers smoothly down to the grip section making it easy on my hand. This is a little nit-picky but I think it is important to note that there is a little give between the cap and the body when the pen is capped. When I pull the cap and pen slightly away from each other but not so much till I uncapped the pen, there is a slight give and a gap between is visible. I really enjoy this pen so much more over my Lamy Safari and Al-Star in part because of the different grip section, in part also because of the sleek modern design the Lamy Studio has. I think the Lamy Studio is a natural upgrade from the Lamy Safari and Al-Star. Anyone who is looking to upgrade should take a look at the Lamy Studio. I got the Lamy Studio on a discount from Pen Chalet. This has in no way influence my opinion on the pen reviewed.